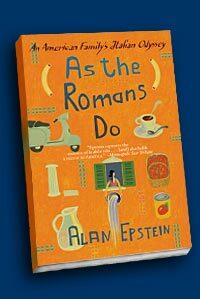 "We were so overjoyed to receive the first two copies of my latest book, As the Romans Do, hot off the press, that we decided to celebrate by taking a long-overdue trip to the countryside. Our first idea was to make it as far as Viterbo, 55 miles to the north, but as usual we got off to a late start and soon realized that as soon as we arrived at the hot springs we would have to turn around and head back to Rome, so we detoured at Lago Bracciano. The lake is beautiful in any season but it was peaceful and serene on what was mostly a hazy day. We stopped first at Anguillara, an ancient hill town that sits in the eastern fold of the lake, and then decided to continue on to Trevignano, a hip resort that has become popular as a place where Romans have their summer and weekend homes. The town has a long lakefront on which you can stroll or ride a bicycle, and the sun was starting to peek through the weak clouds as we started to inquire about a "buon ristorante" as the one we normally go to was closed. We were told that any one of the trattorie in the central piazza was worth the trip, but we finally settled for La Grotta Azzurra, the Blue Grotto, because it had a lovely outside area (although it was still a bit cold for us to lunch all'aperto) and spectacular views of the lake from the second floor dining room. The restaurant served fresh, delicious food, and had an extensive wine list that would suit any choice of dish. Particularly to our liking was a plate of grilled radicchio that tasted as if it had just been picked, dressed, and thrown on the fire, and for dessert a light sponge cake that was doused with the best chocolate sauce I've ever had with "pezzetini" of walnut sprinkled all around. I've often thought that the dolce is what people remember most about a restaurant and so we'll return, most likely when the weather is a bit warmer, especially because most affordable Roman trattorie often make dessert an afterthought. Not La Grotta Azzurra. The management was friendly and accommodating, and the building overlooking the water was also arranged in a pleasing manner. It enabled us to feel that we were a million miles from the city, and yet Diane was able to make her 3:00 appointment. The lake is a perfect Rome getaway, especially in warmer weather."